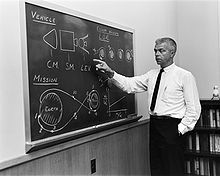 John Cornelius Houbolt (April 10, 1919 – April 15, 2014) was an aerospace engineer credited with leading the team behind the lunar orbit rendezvous (LOR) mission mode, a concept that was used to successfully land humans on the Moon and return them to Earth. This flight path was first endorsed by Wernher von Braun in June 1961 and was chosen for Apollo program in early 1962. The critical decision to use LOR was viewed as vital to ensuring that Man reached the Moon by the end of the decade as proposed by President John F. Kennedy. In the process, LOR saved time and billions of dollars by efficiently using existing rocket technology. Houbolt was born in Altoona, Iowa in 1919. He spent part of his childhood in Joliet, Illinois, where he attended Joliet Central High School and Joliet Junior College. He attended the University of Illinois at Urbana–Champaign, earning a Bachelors (1940) and a Masters (1942) degree in civil engineering. He later received a PhD in Technical Sciences in 1957 from ETH Zurich. Houbolt began his career at the National Advisory Committee for Aeronautics in 1942, and stayed on at NASA after it succeeded NACA, until retirement in 1985. Houbolt was an engineer at the Langley Research Center in Hampton, Virginia, and he was one of the most vocal of a minority of engineers who supported LOR and his campaign in 1961 and 1962. Once this mode was chosen in 1962, many other aspects of the mission were significantly based on this fundamental design decision. He was a guest at Mission control for the Apollo 11 lunar landing. He was awarded the NASA Exceptional Scientific Achievement Medal in 1963. He was a member of the National Academy of Engineering. He was awarded an honorary doctorate, awarded on May 15, 2005 at the University of Illinois at Urbana-Champaign, and his papers were deposited in the University of Illinois Archives. In 2009, the Illinois House of Representatives adopted HR 540 in his honor. He is additionally commemorated in the city of Joliet: The street fronting Joliet Junior College, which he attended, was renamed Houbolt Road; a mural in Joliet Union Station includes a Lunar Module, in reference to his work for NASA; and a wing of the Joliet Area Historical Museum became a permanent exhibit to celebrate his achievements. He lived in Williamsburg, Virginia. In later years he lived in Scarborough, Maine. He died at a nursing home there in 2014 of Parkinson's disease. In the HBO miniseries From the Earth to the Moon, Houbolt was played by Reed Birney. Although the basics of the lunar orbit rendezvous (LOR) concept had been expressed as early as 1916 by Yuri Kondratyuk and 1923 by German rocket pioneer Hermann Oberth, NASA would provide the first practical application of the concept. Some engineers were concerned about the risks of space rendezvous, especially in lunar orbit, where there would be no fallback options in case of a major mishap. Houbolt had presented the LOR concept to a series of panels. After many technical conferences debating Direct ascent, Earth orbit rendezvous, and LOR, Wernher von Braun supported the concept. While some aspects of Houbolt's initial estimates were off (such as a 10,000 pound Apollo Lunar Module which was ultimately 32,399 lb (14,696 kg)), his LOR package proved to be feasible with a single Saturn V rocket whereas other modes would have required two or more such rocket launches (or larger rockets than were then available) to lift enough mass into space to complete the mission. Leading up to the first mission of the Space Shuttle, STS-1, in 1981 Houboult co-wrote a letter with structural engineer Holt Ashley to Chris Kraft, director of Johnson Space Center, imploring him to delay the launch believing the orbiter would suffer major loss of thermal protection tiles, and potentially lose the vehicle. Of particular concern was a strut attaching the nose of the orbiter to the External Tank. Langley Research Center urged further wind tunnel testing, which Kraft reluctantly agreed to do. While the tiles had been an ongoing concern since the original development of the Shuttle, the teams involved believed it was safe to fly by that point. Upon jettisoning, the External Tank did show heat damage around the forward strut area, as feared. On reaching orbit some tiles were visibly missing around the tail of the Shuttle, and fears that the more-critical tiles on the underside of the vehicle were damaged led to a hastily-arranged effort to use KH-11 KENNEN spy satellites and the Kuiper Airborne Observatory to acquire imaging of the Shuttle in orbit to assess the damage. Fortunately, the damage was minimal, and the mission concluded safely. Somewhat as a voice in the wilderness, I would like to pass on a few thoughts. Thank you, John.—Wernher von Braun to Houbolt upon the successful landing of Apollo 11. This passage is caught on a NASA film taken at Mission Control in Houston and possibly one of the most important remarks made in the history of U. S. manned spaceflight. If Houbolt had not pushed the LOR concept—risking his NASA career and professional reputation—it would have been unlikely the first successful lunar landing and return mission could be accomplished by President Kennedy's 1970 completion date. Von Braun recognized this and personally invited Houbolt to the control center for the event. ^ a b "John C. Houbolt:: An Inventory of the John C. Houbolt Papers at the University of Illinois Archives". Library.illinois.edu. Retrieved 2010-09-01. ^ "Houbolt". Astronautix.com. Archived from the original on 2010-01-31. Retrieved 2010-09-01. ^ "NASA - The Rendezvous That Almost Wasn't". Nasa.gov. Retrieved 2010-09-01. ^ "Dr. John C. Houbolt". Nae.edu. Archived from the original on 2010-05-29. Retrieved 2010-09-01. ^ "MOON LANDING'S OTHER HERO - DR. JOHN HOUBOLT OF JOLIET - Herald-News (Joliet, IL) | HighBeam Research - FREE trial". Highbeam.com. 1999-08-01. Archived from the original on 2012-11-04. Retrieved 2010-09-01. ^ "John Houbolt". Cityofjoliet.com. Retrieved 2010-09-01. ^ "3 Missions, Modes, and Manufacturing". SP-4206 Stages to Saturn. History.nasa.gov. Archived from the original on 2004-10-31. Retrieved 2010-09-01. ^ James R. Hansen (December 1995). "Enchanted Rendezvous: John Houbolt and the Genesis of the Lunar-Orbit Rendezvous Concept" (PDF). Monographs in Aerospace History Series #4. Archived from the original (PDF) on 2006-09-29. Retrieved 2006-06-26. ^ White, Rowland; Truly, Richard (2017-04-18). Into the Black: The Extraordinary Untold Story of the First Flight of the Space Shuttle Columbia and the Astronauts Who Flew Her (revised). Touchstone. ISBN 9781501123634. ^ Tennant, Diane (2009-11-15). "Forgotten engineer was key to space race success | HamptonRoads.com | PilotOnline.com". HamptonRoads.com. Retrieved 2010-09-01. James R. Hansen (December 1995). "Enchanted Rendezvous: John Houbolt and the Genesis of the Lunar-Orbit Rendezvous Concept" (PDF). Monographs in Aerospace History Series #4. Archived from the original (PDF) on 2006-09-29. Retrieved 2006-06-26. "Interviews with Dr. Wernher von Braun" (PDF). Archived from the original (PDF) on 2010-05-27. Retrieved 2010-09-01. "Buzz Aldrin's Roadmap To Mars". December 14, 2005. Retrieved 2010-09-01. "Shoot the Moon". PAUL TUCKER WITHINGTON. 2003-10-09. Retrieved 2010-09-01. The Soaring Achievements of John C. Houbolt Permanent, 2-story museum exhibit about John Houbolt and his contributions to the space program. ""Nova: To the Moon" transcript". July 13, 1999. Retrieved 2010-09-01. "John Houbolt — Dad". April 15, 2014. Retrieved 2014-04-19. This page is based on the Wikipedia article John Houbolt; it is used under the Creative Commons Attribution-ShareAlike 3.0 Unported License (CC-BY-SA). You may redistribute it, verbatim or modified, providing that you comply with the terms of the CC-BY-SA.